What are the side affects? A couple of them, my mom was suffering with...joint aches and tiredness in the legs. We told her she needed to get off of them ASAP!!!! One other thing that they had learned was when on statins you NEED to take CoQ10, because the drug will deplete it from your body. A lot of doctors, including my mom's, never mention it. Several weeks after all this started, my mom went on a cruise with my sister and I. Normally, Mom is the first one off the ship and walks pretty quickly. This particular trip, though, she did not feel like getting off, and just seemed tired all the time. HMMMMM! As time went on, Mom's aches and pains grew worse, and sometimes she would have shortness of breath. She talked to her doctor about it, and got no where. Eventually, Mom is referred to a pulmonary doctor, but the doctor pretty much ignores her. By this time, my mom had her 80th birthday, and the doctor writes her off as an old woman who is not active. WRONG!!!!! Up until these aches and tiredness started, Mom has been very active. She goes to the gym everyday, keeps up with her two grand sons who have autism, and enjoys life. Before she went to this pulmonary doctor, I talked to my parents, and reminded them of my blot clot story (DVT and PE). I told them to mention that to him. I had very few symptoms. Mom's symptoms were minimal, but she did have the achey legs and shortness of breath. My parents mentioned blood clots to the doctor, but he didn't believe that was her issue. He ordered three tests, one of them being a test to check for blood clots...but this was not to happen for several months. WRONG!!!! If you are checking for a blood clot, you do it immediately!!!! So, that was the end of the doctor visit for a few months. I kept nagging and nagging about checking for blood colts. Well....Friday, a couple of weeks after she had seen the pulmonary specialist, my mom's shortness of breath came back, but this time it was really bad. She called the doctor about it, and they said they would call her back. Three hours later...no doctor. I begged her to go to the ER!!!! Guess what!!!!! She had blood cots....in her lungs. Yep, the doctor, who wrote my normally active mom off as an old inactive geratric, missed the mark! Luckily, I had gone through this several years ago, and was able to nag her until she got sick of hearing me. I do believe that if she would have waited for that doctor to do his thing, she would not be with us. Why am I sharing this? Well....we need to be aware of our health. We need to ask questions, and be proactive with our doctors. If the doctor won't listen, go somewhere else. Doctors are there to help us, not to make us feel inferior! If we educate ourselves and listen to our bodies, this can help the doctor determine what health issues we may be having. I also feel it is important to share your experience with others. This helps individuals to be aware of what may or may not be going on with their bodies. One last thing....I have been making autism awareness bracelets for the last few months. Many of the colors I use with these bracelets are also awareness colors for other health issues. One of them being blood clots....PE/DVT....Red! 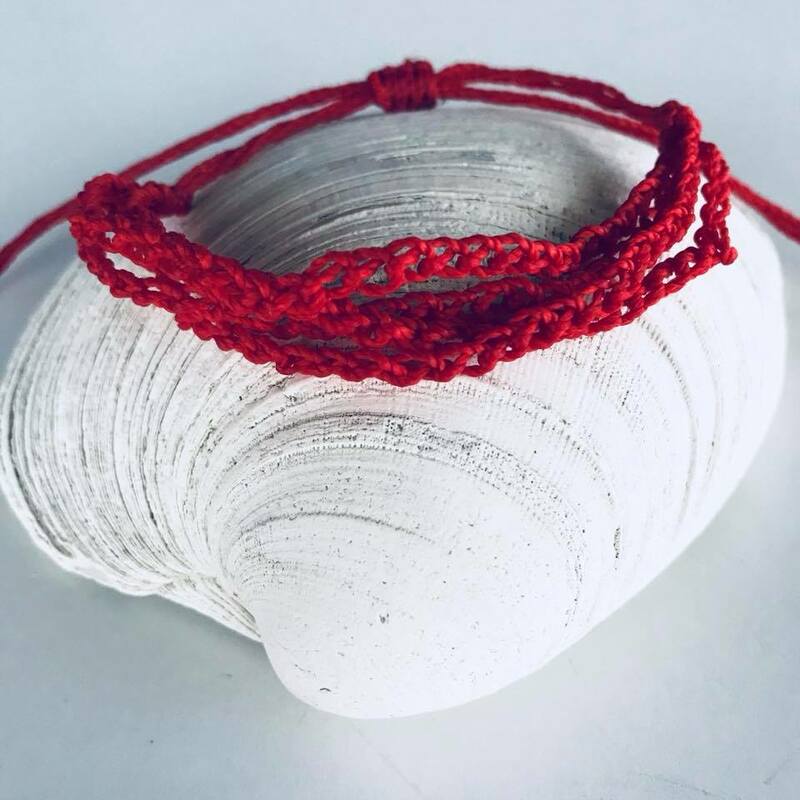 If you or a loved one has suffered with DVT and or PE, and want to help bring awareness, I hope you go check out my TappingflamingoBling Etsy Shop for a fun crochet red bracelets that is water proof! Great to wear to the beach or pool! In the meantime....let us all be aware of our health, educate ourselves, and communicate with our doctors.